This interview with Jon Hirschtick was conducted as part of the "People's CAD Interview" and originally appeared on isicad.ru in Russian. It is published here by permission. Since 2004, isicad.ru/isicad.net have been the leading Russian web resources on engineering software. They are edited by David Levin. 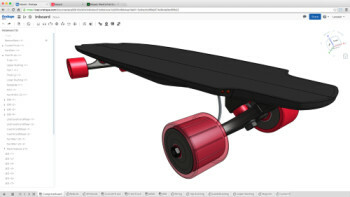 What are the competitive advantages of Onshape over Fusion 360? Onshape is unique because the CAD system and the CAD data live in one place in the cloud and are never copied anywhere. Because all users are always looking at the exact same data, there is never an issue with being out of sync or not looking at the latest version—no need for locking, checkout, autosave, etc. All users can edit anything with no fear of overwriting others. Onshape uniquely provides simultaneous editing and a “real-time single source of truth”—all users in the world see the latest data at all times. 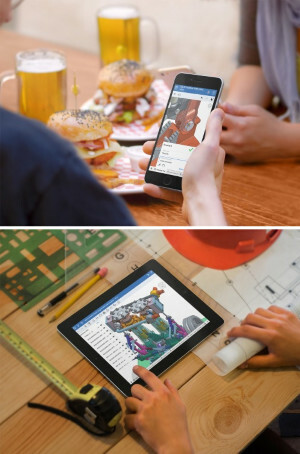 And Onshape’s full-3D CAD system (not merely a viewer) runs on phones and tablets and in browsers on all flavors of PCs (Windows, Mac, Chromebooks and Linux). Systems such as Autodesk’s and others are “semi-cloud” approaches. Traditional desktop-installed software must be downloaded from cloud servers and installed on each computer. Unlike Onshape, that full-3D CAD system does not run on phones, tablets, Chromebooks, Linux, etc. 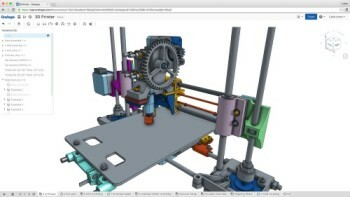 CAD files are downloaded and copied from cloud servers to each user’s computer. With copied files, true unrestricted collaboration is not possible. Users need to worry about who is involved in editing, locking, checkouts, etc. These systems are really no different in process from using SOLIDWORKS (which also can be downloaded and installed from cloud servers) with Dropbox (which supports file-copy workflows with cloud servers). Onshape shows the possibility of simultaneous modification of the same part (solid body) by several designers. Based on the existing experience of Onshape users, can you say that this functionality is relevant, important and useful? Even if users don’t care about editing the same part or assembly at the same time, they really love not having to worry about it every time they open a model. Think about that last point. 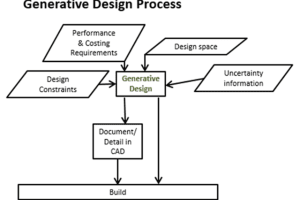 With a team using traditional CAD, every time users open a model, they need to worry if anyone else has the model open, if anyone else has a more recent version, etc. With Onshape, there are no worries. Everyone sees the latest version and there's no problem if two people open a document at the same time. In addition to putting CAD in the cloud, what’s new in Onshape in terms of innovations compared with SOLIDWORKS? Onshape’s “Part Studios” make it very easy to build multiple parts and small assemblies in one feature history. 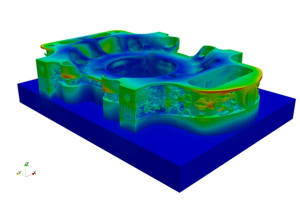 Single features can operate on multiple parts. Each of the multiple parts generated by a Part Studio can be individually inserted into assemblies and moved with respect to one another. Onshape also uses “high-level mates” based on mate connectors. That means that we require merely one mate per pair of parts versus the two or three low-level mates that are typically required. Onshape’s compound document structure means that any Onshape document can contain any number of “tabs.” Each tab can contain what is typically thought of as a file in traditional CAD: assemblies, Part Studios, drawings, etc. Although a tab can contain any type of data—PDF files, native CAD files from other systems, text files, application data, etc.—the entire set of tabs can be shared and version-controlled as a unit, making it easy for teams to evolve complex structure and content of their projects. We also have built a lot of innovative collaborative features, such as true simultaneous editing, branching and merging, etc. Another innovation is how quickly Onshape develops and delivers new features, fixes and enhancements—and always guarantees everyone is on the same version. Every few weeks, Onshape releases automatic upgrades to your CAD system. There's nothing to download or install—just refresh your browser. Compare this to waiting for a year or more to install updates with traditional CAD. When improvements are released, Onshape users receive “What’s New” updates in our blog and newsletter. You can sign up for “What’s New” notifications here. I could go on with many more Onshape enhancements, but these are a few that come to mind. How many users does Onshape have? How many commercial users (who pay fees)? Onshape Beta currently has more than 10,000 active users. 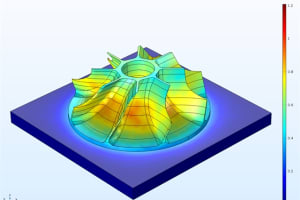 We have not announced the number of Professional Plan subscribers, but we have many who are using Onshape today to speed up the design of consumer electronics, medical devices, machine parts, mechanical machinery, industrial equipment, household goods and other products. For examples, please check out Onshape’s Customer Stories page. Who is your typical user? Very small organizations and individual designers? Onshape has been successful in organizations big and small—anyone who needs to save time, increase innovation and reduce the cost/hassle of CAD and related PDM [product data management] systems. Consumer products and mechanical machinery have been two great customer segments so far at both large and small companies. It looks like with Onshape that you built a new CAD environment not for DIY customers, but for the big guys. 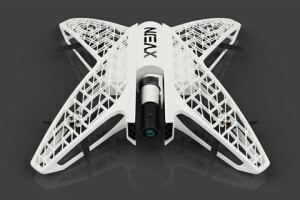 Is your main target a corporate market, while personal usage of CAD with 3D printers is not a priority? We built Onshape with a focus on professionals, but we also welcome DIY users and makers. Although Onshape’s most significant impact will be speeding up the design and promoting more innovation for commercial products, our Free Plan still offers an unprecedented solution for DIYers and makers. By the way, many makers are tomorrow’s startups. Onshape is also an ideal tool for professional CAD users who want to explore projects outside of work. 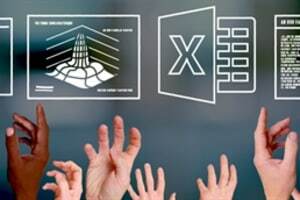 Are at-home CAD users one of Onshape’s major target groups? 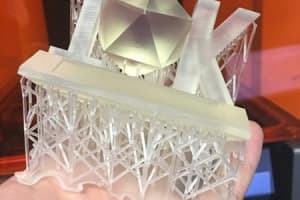 If yes, then what special features address the many technological limitations in producing 3D models on simple and cheap budget-level 3D printers ($300–$800)? How about comparing geometry between the original STL file and results of slicers in G-code? Or smart splitting of nonprintable and printable parts or subparts? Onshape is designed for professional CAD users, but at-home users are welcomed, typically under Onshape’s Free Plan. We at Onshape would not build any features specific to home users and cheap 3D printers, but I would expect that someone could use our API (application program interface) to build some cool applications like the ones you mention. How can Onshape convince the mass at-home user (including freelancers) to substitute the readily available "infinite" license of SOLIDWORKS with the free or very cheap version of Onshape? I want to stress that such users do not really need any collaborative design in the cloud. My instinct is that we shouldn’t be trying to convince at-home users to do anything. If a CAD user works alone and doesn’t need collaborative tools, there are many other advantages to working with a full-cloud system. 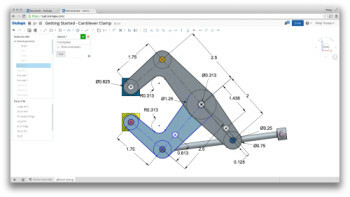 Moreover, Onshape works seamlessly side by side with other CAD systems. People should use whichever system(s) best fits their needs and helps them work fastest and easiest. By the way, the next generation of engineers will look at your question exactly from the opposite perspective: Why would I want to use old desktop-installed software when I could use a full-cloud system, with all of its advantages? Do you have any examples of using Onshape by enterprises in a real production? If it's possible, could you share information about the methodology of using Onshape at these enterprises? Yes, we have many Onshape customers in production. Often they are, of course, already using other CAD systems. They sometimes keep using the old CAD system for projects that have already been started and use Onshape for new projects. Customers almost always use Onshape’s unique collaboration capabilities, our Onshape mobile apps and our version control functions, including branch-and-merge. The benefits they report are typically more speed, more innovation and more fun/less CAD hassles. We have Onshape customer examples, stories and videos on our website. What PDM software can you recommend to Onshape users? Onshape has awesome version control and access control built in at its core, so there is no need for a separate PDM application. Onshape can link to existing PLM systems, providing links to versions of Onshape CAD models and exchanging and syncing metadata via our Onshape API. With traditional PDM, the security and truth of data is only valid on the PDM server. Data must be copied from the server and as soon as that happens, the server and the user’s local copy of the data are out of sync. And of course, the security of that data is now outside the scope of the server. Onshape is the only system to provide a real-time single source of truth. All edits and versions appear to all users in real time, period. And CAD data is never copied to individual users. By the way, with Onshape there is no need to buy, install or administer servers and vaults. Best of all, there is no copying, no locking, no checkout and no need to worry about whether you have the latest version of CAD data. What part of Onshape is covered by its API? Are there any plans for further API developments? Our Onshape API is in early testing with select developers and customers, but we haven’t publicly announced it yet. Onshape’s API covers a large set of Onshape’s capabilities and will enable some very strong applications. Of course, it will evolve, improve and expand over time like every other aspect of our products. 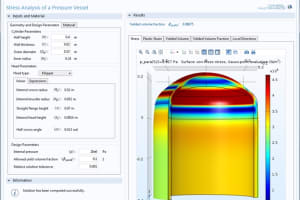 Are you going to provide advanced motion simulation tools inside Onshape? It could be a lot of fun making live mechanisms in the cloud. 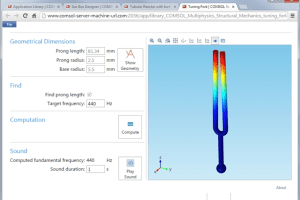 Yes, we will have partner applications that do motion simulation inside Onshape. And yes, it will be a lot of fun making mechanisms in the cloud—and doing lots of other things such as CAM, CAE and rendering in the cloud too! In the future, do you see Onshape also becoming a tool for plant design and engineering? No. We have no plans to become a primary system for plant design and engineering. Of course, Onshape could be used to do parts of these applications such as design of equipment and components. And it is possible that Onshape partners may create applications to address more tasks in plant design. Do you have any plans to deliver an Onshape version of a corporate (private) cloud—one that could be installed in a company's data-processing center? No. We have not seen a need for this so far. Users who require that can stick with traditional CAD. Does Onshape have plans to eventually provide high-performance computing services—services that would solve next-generation CAE and simulation problems (with higher levels of resolution) that cannot be solved on desktop PCs? Yes. Our Onshape cloud already enables Onshape to use lots of computers to make your work faster and more reliable. Both Onshape and our partners will continue to add more and more tools that use the cloud to solve complex user problems faster. This is especially important because, as you may know, desktop CPU speed has hit its limit. Desktop CPUs cannot get any faster. Sure, there may be a few more cores, but if we want massive performance gains in the future, it will have to be via cloud computing. 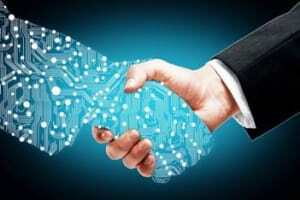 Your CAD-in-the-cloud—in combination with global model sharing and project banks—will create infrastructure to collect design data, as has happened with text and image data already. Will Onshape bring to CAD/PLM the same beneficial data mining, big data analysis and search and analytic tools as Google and others have done for text/image data? Yes. 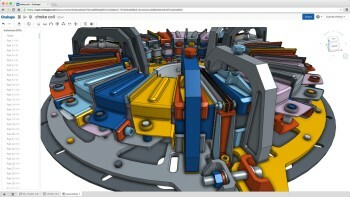 This is already visible via Onshape’s public model library. We already have hundreds of public models edited every hour and of course, this rate is growing. 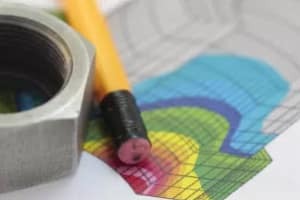 So yes, we hope to offer both our public and private users some very useful tools for studying an unprecedented amount of CAD data. When will Onshape have a toolset for sheet metal design? At some point in the future. We have not announced a timeframe for this yet. 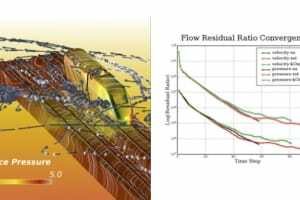 Traditional CAD engines can hardly work in the cloud because of inefficient usage of resources with the model/drawing file approach. 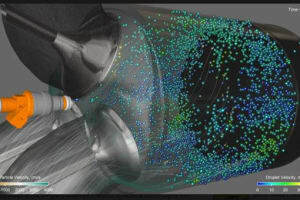 Did Onshape create another way to manipulate model data, thus solving the problem by dramatically reducing the CAD engine’s appetite for resources? Yes. We created an entirely new resource-efficient CAD system architecture for Onshape that is very different from the architecture of a traditional, non-cloud desktop CAD system (which as you note, is very resource-inefficient for cloud usage). Thus, Onshape runs efficiently on normal cloud resources, network connections and browsers, phones and tablets. What web technology stack do you use on the server side? I suppose at least part of this information is confidential, but could you share some details, just as Facebook and Instagram did? We use a lot of tools on the server side, including the Parasolid geometry kernel, Amazon Web Services, the MongoDB database and ARES Kudo from Graebert. The speed, reliability and collaboration capabilities of Onshape are enabled by a globally distributed set of various types of Onshape servers. Are you going to use general-purpose GPU computations in your solution? It looks like this topic is getting hotter and hotter now. Right now, we have not chosen to pursue GPU computation, but that is a possibility for the future. We have observed that most large-scale web successes rely on generic Linux-based computers—and lots of them. We chose a clean-sheet, full-cloud architecture because those other technologies, running desktop CAD on remote desktop servers, don’t solve the big problems that users have. 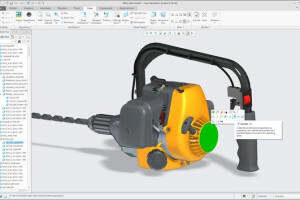 They just move the problems and inefficiencies of desktop CAD software and file-copy workflows to a different computer. They don’t deliver the true big benefits of cloud. We’re not alone with this belief, by the way. Full-cloud has won over semi-cloud in many other industries, including Salesforce versus Siebel, Workday versus Oracle, etc. Everyone remembers the scandal with Edward Snowden and the National Security Agency (NSA) when it became clear that U.S. authorities have access to the servers of Facebook, Google, etc. Does NSA have a similar interest in the servers of Onshape? I do not know whether or not the NSA has interest in any particular servers, including our own. But I would say that our Onshape servers are much, much better secured than what I have seen with almost all CAD users around the world. Onshape provides many layers of protection for your intellectual property (you can read the details here) and we contract with third-party security experts who constantly examine our system for vulnerabilities. And remember that with Onshape, you do not copy your data on many computers. All of your data lives in only one place and you can share and remove access at any time. This is an aspect of CAD security that often gets overlooked. I would say that it’s going to be much easier for the NSA (or anyone else) to get at most users’ CAD data than it would be to get at ours. Do you use your own servers? Or do you use Amazon or Azure web services and hardware? Right now we are all-in with [i.e. we exclusively use] Amazon Web Services and we are very happy. Many engineers and management do not trust public clouds—especially those who work in big governmental organizations. Do you plan to add the option of the private cloud? We have not seen the need for this yet. Again, see my answer above—most private computers are a lot less secure than well-managed cloud services such as Onshape. 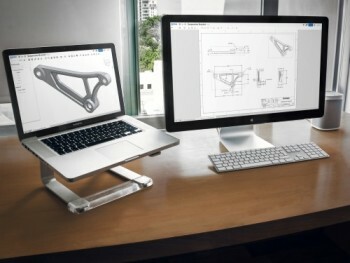 Users who are forced to keep data on their own servers should stick with desktop-based CAD. But, of course, with desktop CAD their data does not stay on their own servers anyway as it's always copied to desktop CAD workstations, laptops, etc., which are usually very poorly secured. With Onshape, there is no such copying—ever. Recent incidents of powerful hacker attacks and Snowden’s disclosure of security breaches raise more questions about the security of public clouds. With CAD-in-the-cloud, there is a possibility to steal a design at the time it is created—thus allowing the company that stole it a chance to launch a product at the same time or even faster than the company that actually created it. How you do respond to this security challenge? Onshape is much more secure than most existing non-cloud desktop CAD installations. Desktop computers are notoriously subject to viruses that are well known. Whether users know it or not, non-cloud CAD data is usually easily vulnerable to illicit theft. Also, bad-intentioned employees and vendors all get perfect copies of files in the non-cloud desktop CAD world. Onshape is the only full-cloud CAD solution that never copies master CAD data to the desktop, so we eliminate these major security problems. And we can offer the ability to let employees and vendors see and even edit cloud CAD data without giving them access to copies of the data. If Onshape applied its technology to private rather than public cloud usage, it could help create an extremely secure environment for classified product design. Using your technology, it will be possible to break down the design of a classified object to a certain amount of components, with constraints and links between them that are hidden from designers. Thus, you would get the same design team structure used in your team for classified object production—different parts are produced in different plants and only personnel at the assembly plant knows what really is being created. Are your main investors now linked to military and defense? Our investors are leading venture capital firms, not military or defense agencies. And on our current cloud architecture, Onshape provides the benefits you are talking about without needing private clouds. You’ve hit the nail on the head. Because Onshape works inside a browser, there is no longer an enormous financial overhead to turn your ideas into 3D models right away. 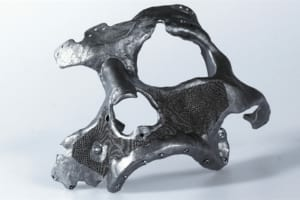 Entrepreneurs around the world do not need access to expensive workstations with enough computing power to handle the complex demands of CAD. You can start your business with an inexpensive Chromebook. 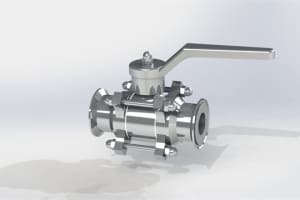 So yes, in addition to reaching people who already use 3D CAD who will add to or replace what they have with Onshape, we believe we can bring the power of 3D CAD to yet another large group of people who need it. 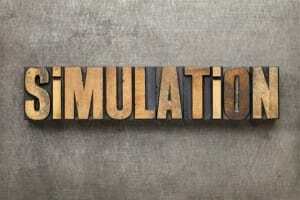 Was there any probability of establishing an Onshape project within Dassault Systèmes (DS)? If yes, what was your vision of how Onshape-DS could live and be developed alongside SOLIDWORKS and CATIA? No, not in the way that I work. It is hard for big companies like DS to give individuals the kind of freedom they need in crafting a vision and choosing how to implement it. DS is a great company, but the environment and process that they have for new product innovation was no longer a match for how I like to work. What is your outlook for the future of SOLIDWORKS? It looks quite positive; however, could it be much better? Or has it already reached its ceiling? Please be candid. 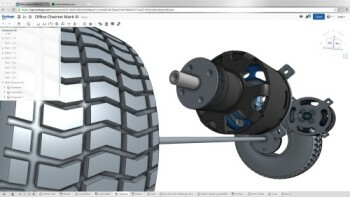 SOLIDWORKS is still a great CAD system and will be for a long time. It has continued to get better and it probably will keep getting better. 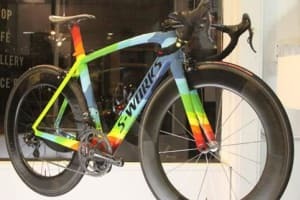 But as a file-based, desktop-installed application, SOLIDWORKS cannot provide the benefits of a clean-sheet, full-cloud architecture—and these benefits are very, very important to design teams. What technology-related challenge in the creation of Onshape would you consider most crucial? 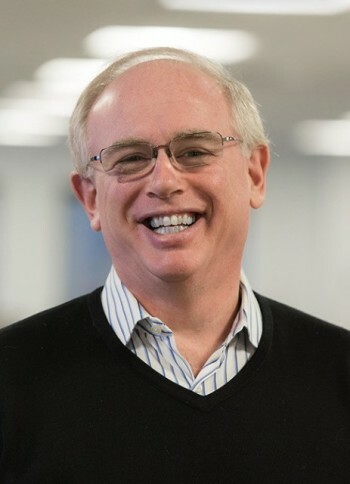 The key, of course, was to recruit great people such as Onshape founders Dave Corcoran, our vice president of research and development and Michael Lauer, our CTO. 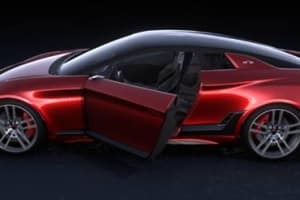 The most crucial challenge was how to achieve the interactive performance that 3D CAD users expect, over standard Internet connections, while also being able to offer global collaboration and access to a huge user community. What differences are there between how Onshape is marketed to the user base and how it was pitched to your investors? No difference. We share the same vision of Onshape and what it can do with our investors, our customers, our partners and the press. Jon Hirschtick, Bob Miner and Steve Hess. What principal advice would you give to a startup that is specific to engineering software? Use Onshape and other full-cloud CAM/CAE applications! Full-cloud/web/mobile solutions are the future. Startups can work faster and be more innovative, while saving money and avoiding CAD system and file-copy hassles. Many startups have a distributed design team, with multiple engineers spread across the country or around the world. 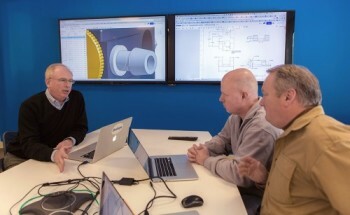 Onshape lets teams such as this collaborate as if they were in the same room—much like the old days when designers worked in one big room around a physical mockup. Do you think there is a special marketing problem for Onshape—that end users and/or investors don't distinguish between SOLIDWORKS and Onshape? No. 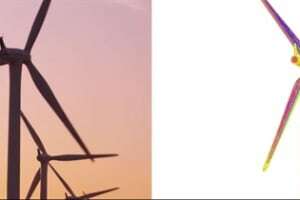 We have not encountered any confusion between the two companies. At SOLIDWORKS, you (together with John McEleney and Jeff Ray) brilliantly and creatively employed a pure channel product-distribution model. At that time, all of its strong and weak points were well known, and there were enough application practices and experienced staff on the market. Onshape is distributed using a freemium-SaaS model, which requires completely different tools and measurements. Experience of applying this business model to professional software (unlike games, for instance) either does not exist or cannot be considered successful yet. Very few people understand how it works. How would you compare the challenges facing the Onshape team in terms of technology versus distribution? 60/40, 70/30 or another combination? 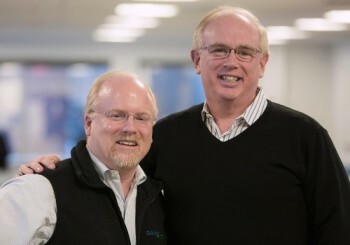 John McEleney and Jon Hirschtick. Great question. One more person I want to point out who was key to the SOLIDWORKS channel model was Vic Leventhal. But you are not totally correct in your statement. Lots of companies have already proven the freemium-SaaS model to be successful for professional software. True, our Onshape freemium-SaaS business model is new to the CAD market, but many other professional software companies successfully use this type of model, including Salesforce.com, Atlassian and GitHub. We have studied how these companies successfully do SaaS in professional markets and will be building some similar ideas into our Onshape business model. 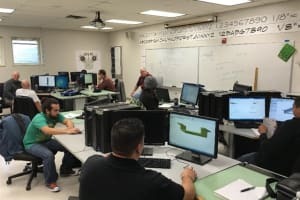 I would say that at Onshape, much like at SOLIDWORKS, the business model is 50 percent of the work – equivalent to the technology challenge in both companies. What's the difference between Onshape’s revenues today and over the next two to three years—and how about the total value of the company based on investments? Sorry for a not-so-polite question. Nobody, not even me, knows exactly what Onshape’s revenues will be three years from now. But I can say we have been very pleased with our revenue so far. We expect our revenues to continue to grow strongly for years to come. In terms of investments, to date, Onshape has raised $144 million from partners Andreessen Horowitz, New Enterprise Associates, Commonwealth Capital Ventures and North Bridge Venture Partners. We don’t release our company valuation. How would you characterize the state of software technology in the AEC domain? 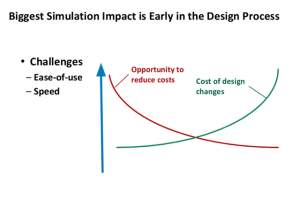 Perhaps the real innovation and breakthrough for CAD could be achieved in AEC/BIM? First, it seems that this sector (Revit, ArchiCAD, etc.) is lagging technologically. Second, it seems that the construction industry in many countries is booming. What is required or more probable for the revolution in AEC-CAD: fundamentally new original approaches or extending MCAD? Could Onshape lead a new approach or could it be extended into the AEC direction? I have been on the board of two AEC companies, Revit and Vela (both were acquired by Autodesk, by the way). Onshape is not working on this market. It is possible that someone may be able to use Onshape via our API to solve some problems in AEC, but this is not a focus for us. Our friend and partner Graebert GmbH recently announced Kudo, which is a cloud CAD solution that is perfect for the AEC industry. Check it out here. Jon, could you tell our readers something about you personally, beyond Onshape? Your family, friends, hobbies, vacations, travels, cars, music, books, movies, theater, kind of sports (blackjack? ), etc.? I was a member of the MIT blackjack team back in the 1980s, which was a lot of fun and taught me a lot of lessons that are useful in business. There are a bunch of books and TV programs and a movie about the team. The most accurate TV show is “Breaking Vegas” from The History Channel. I've also worked as a professional magician. I did around 200 magic shows when I was 14 to 17 years old. When you next see me, I’d be happy to show you a couple of card tricks! I like to practice yoga (hot power vinyasa yoga) and someday hope to complete yoga teacher training. I also play golf, go to the gym and sometimes run. I am a fan of the Boston Red Sox and New England Patriots. I grew up a fan of the Chicago Cubs. Jon, which lifehacks do you use to not get lost in a huge pile of information (both corporate and external)? Do you use a pencil and paper notebook? Or do you add bookmarks in a web browser? How does a leader of such a product as Onshape study new developments and products of competitors, read articles, check emails and so on? I do like to carry a paper notebook to jot down moments of inspiration and also keep track of the day’s most important events. For all the efficiencies of the cloud, I feel a more direct connection to my to-do list when I am writing it down with old-fashioned pen and paper. I have a strong preference for Shinola journals. These are made in Detroit and are high quality. I carry my journal everywhere and take a lot of notes during meetings and calls. I also record random thoughts, tasks for my to-do list, etc. I have paper notebooks like these covering the last 20 years of my life. The other key item I carry is a four-color pen (yes, like the kind we had as children). My good friend Bob Karp introduced me to these a few years ago, saying he had seen them used a lot by businessmen in Japan. 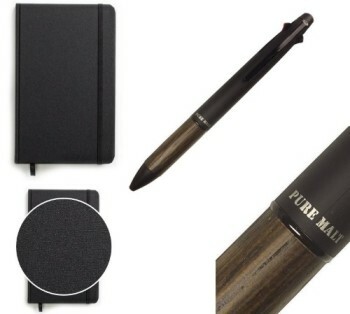 My favorite is the Uni-Ball Jetstream ballpoint with pencil. The barrel is partially made of wood—which is nice in our plastic and metal world. I find that multicolor notes are key to organizing things easily. Red equals things to do, green equals things to follow-up in our management meetings, etc.—a fairly loose but useful system. I use a 15” MacBook Pro and love it—and of course, Onshape runs great on it! It's the best computer I’ve ever used, period. I use Gmail for work email and Google Inbox for personal email. I really like Google Inbox for wading through the tons of personal emails that I get every day. I have Gmail set up with filters and labels to do things such as organize Onshape support tickets—I try to read them all!—so that they are not in my general inbox. I also try to browse Twitter and some of the good CAD websites—such as isicad.ru—although the Google Translate results are not always so accurate. It’s really tough to stay on top of everything, and honestly, I usually feel fairly overloaded with things to read and do. Maybe your readers can offer some productivity tips to me! Do you feel like the Elon Musk of the CAD industry? I’m flattered by the comparison—thank you. And I’m a great admirer of Elon Musk. I’ve been lucky enough to be part of some of the great changes that have happened in CAD. But the work we’re doing at Onshape is the achievement of every one of our 80+ people, plus many pioneers from the long history of the CAD industry. 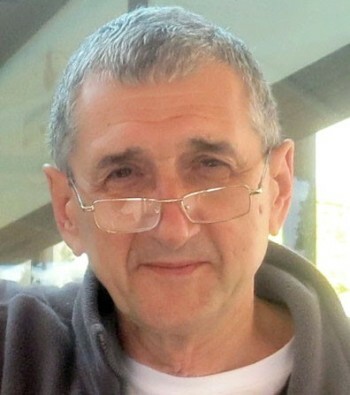 David Levin is the editor-in-chief for the CAD/PLM portals isicad.ru (Russian) and isicad.net (English). He was CEO and one of the founders of LEDAS Ltd. He has a PhD from the Faculty of Mathematics at Moscow State University. David has worked and done research in the fields of computational mathematics, software engineering, and artificial intelligence (AI). He has published two books. He was Director for Research of Russian Research Institute for Artificial Intelligence. In 2013, David was awarded a Lifetime Achievement Award by the CAD Society.